WTA volunteer on the Comet Falls Trail, a photo by The Bacher Family on Flickr. 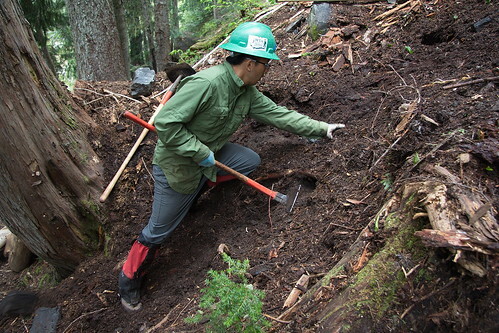 The Washington Trails Association has been hard at work rerouting a short section of the Comet Falls Trail in Mount Rainier National Park, where a washout this spring took a huge chunk out of he trail. After a month-long closure, the trail at last reopened today (though there are indications that more nasty surprises may await trail crews when the snow fully melts from the upper end of the trail). I took this photo at the end of June as volunteers were literally carving a new trail out of the mountainside. If this looks like fun -- and what's not to like about spending a day helping out in one of the most beautiful places on earth? -- there's still plenty of work to be done! WTA leads volunteer projects every Friday through Sunday at the park all summer long. Check out their volunteer projects at www.wta.org, or look for other volunteer opportunities at rainiervolunteers.blogspot.com.